Have you heard about water help to loss weight? You need all the help you can get to shed all those extra pounds, right? Some people believe it can, so let’s take a look at this theory to see if it holds any merit. Weight loss is all about consuming fewer calories each day than what you burn up. This sounds simple enough doesn’t it? So where does water come into play? Water contains zero calories so you can literally drink as much water as you like without putting on weight. However, you should realize you can drink more water than is good for you. If you should happen to have a water retention problem; it is best to check with your Doctor before going overboard with your water drinking. But in contrast to any other beverage, you do not need to think twice before drinking water. In fact it should become a regular part of your day as drinking lots of water assists in overall health and well being too. Water flushes out your system and is simply the best liquid you can drink. If you are trying to lose weight, then ultimately you should totally eliminate any sugar based drinks from your diet. A good example of these types of drinks would be carbonated soft drinks. These drinks contain nothing of substance and are full of artificial ingredients, not to mention sugar and calories. If you drink two cans of soda per day, it could be just those extra calories that are causing your weight gain. So substituting these with water can eliminate the cause of your weight gain. How simple is that! Some people don’t like the taste of water. Water lovers can’t understand this, but it’s a fact. In all likelihood, people who say they don’t like water probably have only tried plain unfiltered tap water. 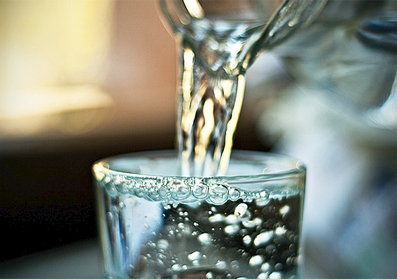 Tap water also tastes different depending on where you live and even on a house by house basis. If you‘re a person who dislikes the taste of water based on what comes out of your tap, then try buying spring water. The taste of spring water even differs by brand, so keep trying them all until you find one you like. Spring water, in some cases, is more pure than tap water and doesn’t contain any harmful bacteria. Some of the best quality spring water tastes absolutely delicious, so make sure you find one to your liking. Back to water help to loss weight; keep in mind that water is never a substitute for food, but it should simply complement your healthy diet. Instead of a soda or sugar fruit juice at dinner, have a glass or two of water. It is also recommended to start the day off with a refreshing glass of water as it gets your brain active. Drinking water throughout the day also enhances brain function and keeps you alert. You may start noticing that if you don’t drink water, for most of the day, you’ll suffer from headaches and tiredness. Water is a wondrous natural substance that all humans need. Water help to loss weight may be the best help you can get, when you are shedding all those extra pounds.